DENVER (AP) - Dexter Fowler tied a modern-day rookie mark with five stolen bases as the Colorado Rockies ran their way to a 12-7 win over the San Diego Padres on Monday night. The fleet-footed Fowler gave the Padres fits all night, becoming the first rookie to steal that many bases since Damian Jackson on June 28, 1999. That contest also involved Colorado and San Diego. The game was halted in the sixth inning when Brad Hawpe was hit in the neck by San Diego catcher Nick Hundley's throw to second. Hawpe was taken off the field in a cart and then to a hospital with a possible concussion. Fowler was on base four times as he singled twice and drew two walks. He stole second and third on two different occasions. 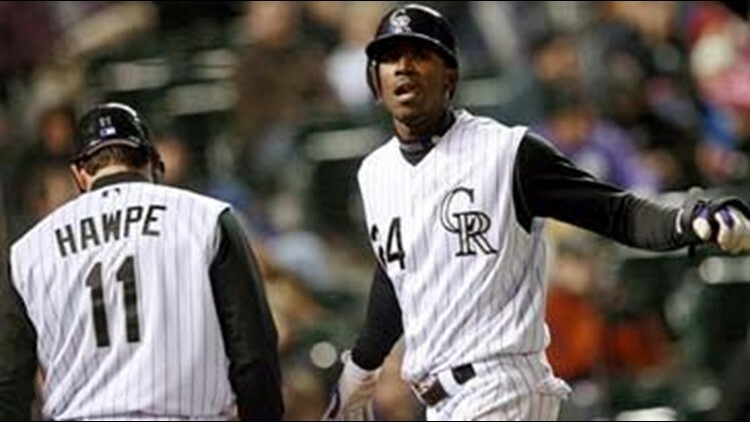 His five thefts for the game tied Willy Taveras for second-most in Rockies history. The team record is six by Eric Young on June 30, 1996. The Rockies stole eight bases, the second-most in team history. It was two shy of the franchise mark set on the same day as Young's record. All eight of the stolen bases were on the battery of Chris Young and Hundley. Jason Grilli (1-1) picked up the win in relief for Colorado after pitching 1 1-3 scoreless innings. He struck out three. Jason Hammel made his first start in a year and surrendered five runs in three innings. The Rockies picked up Hammel from the Tampa Bay Rays earlier this month for a minor league pitcher. He made three appearances out of Colorado's bullpen before getting the start Monday. Young (2-1) was hit around hard Monday night, giving up a career-high eight runs in just three innings. Young had a career mark of 5-1 against Colorado with a 3.28 ERA before the meltdown. Ian Stewart drove in three runs for the Rockies, two coming on a two-out double in the third, while Garrett Atkins had three hits and two RBIs. Hawpe had a walk and two hits, including a two-run double, before leaving the game. His injury occurred when Hundley scooped a ball out of the dirt and fired a throw to second to try and pick off Hawpe, who was sliding back into the bag. The throw sailed to the shortstop side of the base. Hundley winced as he watched Hawpe get hit by the baseball. Jody Gerut came into the game hitless in his last 16 at-bats, but broke out of his slump in a big way with a single, double, and home run. This was Luis Rodriguez's first game back since missing two due to an allergic reaction to something he ate. Notes:@ The Padres purchased RHP Chad Gaudin's contract from Triple-A Portland on Monday and designated RHP Eulogio De La Cruz for assignment. Gaudin will start Tuesday night against the Rockies. ... RHP Cha Seung Baek (strained forearm) begins a rehab assignment with Single-A Lake Elsinore on Tuesday night. ... Hitless in his last 19 plate appearances, Rockies SS Troy Tulowitzki took a seat on the bench Monday night. He's hitting .167 this season.